Foodie Friday: July Fourth Salads! 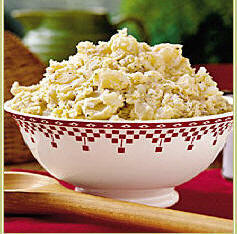 Most families seems to have potato salad recipes that are passed along from generation to generation. This is my mom’s recipe that’s a family favorite. It’s quick and easy to fix . The pickles give it a nice crunch and combined with mustard a little sweet/tart taste. In fact, it’s on my Fourth of July menu. Enjoy! Place the potatoes in a large saucepan. Cover with cold water salt and place over medium-high heat. Bring to a boil and cook until the potatoes are tender, about 15 to 20 minutes. Drain and let the potatoes cool. Then peel cut into bite-size pieces. In a separate bowl, mix mayonnaise, mustard, salt, and pepper for dressing. Add egg, olives, pickles and potatoes and bacon. Serve chilled. Serving Suggestions – Sprinkle Red Paprika over top for a dask of color. Jody Devere Has Written 4 Articles For Us! I am the CEO of AskPatty.com, Inc. a social media marketing to women expert, journalist, car care & safety spokesperson with more than twenty-five years of achievement as a successful entrepreneur focused on sales and marketing leadership including ten years developing web based business solutions across diverse industries. Currently I serve as the COO of the Woman’s Automotive Association International and am a member of the Car Care Council Women’s Board, California State Advisory Board for SkillsUSA, Board member of UnitedSpinal.org, SEMA Businesswomen’s Networking Association and is a Contributing Editor for the Car Channel on Blogher.com.